Are you looking for love in all the sexiest – but wrongest places? Want tools to help you recognize the signs you’re in a toxic relationship – and – also figure out how to better avoid toxic love in the first place? 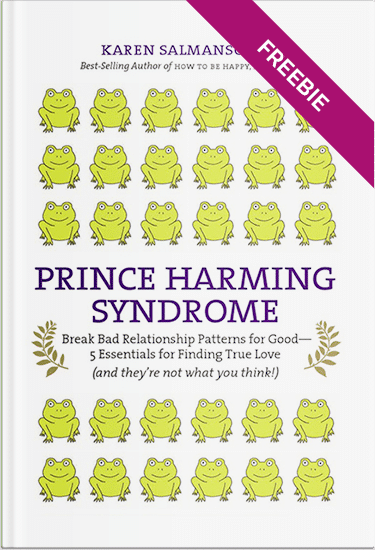 Check out my Prince Harming Syndrome ebook – which was recommended on Oprah’s site – and which I’m now giving away for FREE. The time has come to stop wasting your heart and time in anger and obsession – re-living the pain of relationships past. The time has come to put your love and time into learning from your mistakes – and getting new love tools – so you can successfully find a partner who is far more right for you! Oh – and yes – the relationship tools in Prince Harming Syndrome apply equally to Princess Harmings!